The Daily Star treated its readers (if they can read) to another misleading front page headline about a reality TV show. 'Talent Sue Makeover Shock' jumps on the Susan Boyle bandwagon (when will the backlash begin...) and clearly implies she has had a makeover. 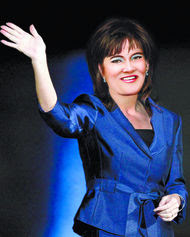 In fact, someone they call 'computer wizard Ian Angel' took her face, made it look both totally unreal and totally unlike her, and then stuck it on the body of a waving Sarah Palin. I'm not sure whether it's more insulting to call this wizardry or a front page 'picture exclusive'.